Recognizing life-saving engineering solutions that agencies have integrated into their roadway safety programs. I have no doubt you'll be as impressed as I am by the ingenuity and effectiveness of these projects. It is my pleasure to present the nine winners of the 2017 National Roadway Safety Awards, a biennial competition sponsored by the Federal Highway Administration and the Roadway Safety Foundation to spotlight the nation's very best efforts by public agencies to save lives on our nation's roadways. As you read through the case studies that follow, I have no doubt you'll be as impressed as I am by the ingenuity and effectiveness of these projects – from Virginia's “instant round- about" to Missouri's innovative design-build competition that will address dozens of trouble spots across the state. Moreover, you'll see that these agencies have been tremendous stewards of taxpayer funds and found ways to achieve impressive safety successes despite limited resources. The awards program has twin goals – recognizing outstanding public agencies and their staff, and promoting the projects themselves in the service of best practice sharing and encouraging their use elsewhere. This Noteworthy Practices Guide is an important component of that second goal, as here you'll find practical and proven ideas, helpful graphics and visuals, and contact information for key project leaders. All of us at the Federal Highway Administration and the Roadway Safety Foundation hope to see these innovative ideas spread as we move the United States along the Road To Zero deaths. Please join me in congratulating all of the winners of the 2017 National Roadway Safety Awards! At a time of increasing traffic fatalities and aging infrastructure, now more than ever we need to identify where progress is being made. The National Roadway Safety Awards is one of my favorite endeavors in our Foundation's portfolio. It is the time when we get to hear directly from professionals in the field who are making a tangible difference, and honor these unsung heroes' dedication, innovation, and demonstrated lifesaving successes. At a time of increasing traffic fatalities and aging infrastructure, now more than ever we need to identify where progress is being made, and amplify those lessons learned for the benefit of others. We can reach our goal of zero deaths on the nation's roadways, but it's an effort that must proceed city by city, county by county, and state by state. This Guide presents some of the very best examples of what that means. I'd be remiss not to thank our partners at the Federal Highway Administration, who provide the national leadership on roadway safety and who have supported this Awards program since its inception. Their spirit of collaboration and dedication to efficient diffusion of safety innovations has saved countless lives and set a national example for how we will ultimately eradicate traffic deaths. On behalf of the staff of the Roadway Safety Foundation, I extend my heartfelt congratulations to all of the winners of the 2017 National Roadway Safety Awards, and my thanks to all of our excellent applicants. 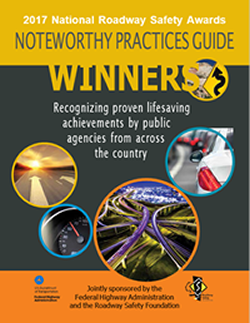 Whether you're reading this Guide to find ideas that you might be able to replicate in your agency, or whether you're simply reading it to learn a bit more about how your state or local highway officials are working to keep you safe, I hope you'll take from it a renewed appreciation for the vital role that safe roads play in saving lives. Thank you again, and congratulations! Based on statewide crash data, 38% of fatalities and 21% of serious injuries in the state of Delaware involved a roadway departure crash. Half of these crashes occurred within a horizontal curve. Additionally, wet/snowy/icy pavement accounted for 22% of roadway departure fatalities and serious injuries. 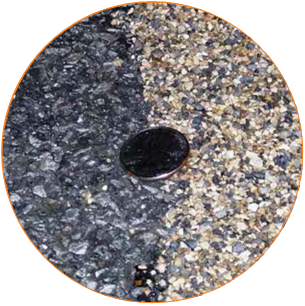 High-friction surface treatments (HFST) are pavement applications that can dramatically and immediately reduce crashes at locations such as horizontal curves or where wet road surfaces reduce pavement friction. To address roadway departure fatalities and serious injuries, DelDOT implemented HFST as a safety improvement through the State's Systemic Safety Improvement Program (SSIP). As part of the SSIP, candidate locations for HFST were identified by reviewing the rate of roadway departure crashes that occurred on wet/snowy/icy pavement for all roadway segments in the state. Each candidate location was then screened to determine the feasibility and appropriateness of installing HFST. Factors considered included pavement condition, date of last resurfacing project, date of next resurfacing project, and presence of horizontal curvature. Once final locations were selected, DelDOT utilized a three-year, open-end contract established for HFST implementation using Highway Safety Improvement Program (HSIP), High-Risk Rural Roads Program (HRRRP), and Section 154 Penalty Transfer Funds. As of April 2017, more than 33,396 square yards of HFST have been installed at over 20 locations. Before/after crash data shows that roadway departure crashes decreased by an average of 56% across all of the HFST locations collectively. Benefit/cost analysis indicates an overall benefit-cost ratio of 23.97. Unlike other safety solutions that may involve geometric changes that require substantial funding, HFSTs are an innovative, low-cost, durable, and effective solution for reducing fatalities and serious injuries. Recently, there was a spike in wrong-way driving (WWD) crashes in Florida, and particularly in the Tampa Bay area during 2014. In one crash, four University of South Florida students were traveling on Interstate 275 when they were struck by a wrong-way driver. All five people involved died in this tragic crash. All totaled, in 2014 the Tampa Bay area experienced seven wrong-way crashes that resulted in 11 fatalities. POLICY – FDOT developed a high-level frame- work that focused Department policy and decision-making on reducing WWD crashes. INFRASTRUCTURE – The agency revised design standards to more aggressively discourage wrong-way entry onto limited-access facilities. In conjunction with these changes, FDOT installed and evaluated emerging and experimental traffic control devices that are specifically designed to mitigate WWD. MONITORING – The FDOT Transportation System Management & Operations (TSM&O) team continuously monitors the WWD infrastructure and tracks its progress. Infrastructure improvements included (a) new minimum signing and pavement marking standards for statewide implementation, (b) FHWA-approved Request for Experiment (RFE) with Red Rectangular Rapid Flash Beacon and Internally Illuminated Raised Pavement Marker installations in the state, (c) a statewide WWD study and three research projects with a focus on deployment and learning, and (d) developing best practices to implement WWD countermeasures. This systemic approach has resulted in a dramatic reduction in WWD incidents. In the Tampa Bay region, for example, in 2015 there were no WWD crashes, and in 2016 there was one WWD crash which resulted in two fatalities. The effectiveness of the innovative infrastructure improvements is continuously monitored by FDOT's State and District Traffic Engineering and Operations Offices to explore every possible avenue to mitigate wrong-way driving in the state. Utility 2, a crash attenuator-modified dump truck. Highway safety is a major concern not only for motorists, but also for the men and women that respond to unplanned traffic incidents. In less than one year in the Grand Rapids, MI area, for example, there were three separate incidents involving a vehicle striking a fire department truck that had responded to a crash scene. A strong Traffic Incident Management Team (TIM) has been formed in the city of Grand Rapids to increase highway safety for everyone during emergency traffic incident responses on freeways. Partners on this team include representatives from the Michigan Department of Transportation (MDOT), Grand Rapids Police & Fire Departments, Michigan State Police, Kent County Road Commission, and the City of Grand Rapids. Over the past six years, this coalition has been able to successfully implement various innovative and unique initiatives to minimize first responders' exposure to traffic, and to reduce backups, delays, and secondary crashes associated with unplanned incidents on freeways. 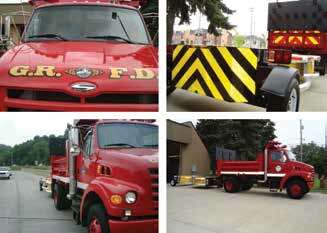 The specific strategies that this team has established include the creation and deployment of the nation's first crash blocking vehicle used by a fire department, which is a modified city dump truck affixed with a crash attenuator. Additionally, the team developed and installed sight distance parking signs for first responders, and implemented high visibility markings on water standpipes along the freeway to facilitate their immediate location by responders. Instant Dispatch Towing has also been implemented, wherein tow trucks are immediately called to the scene of a wreck at the same time that other emergency vehicles are summoned. This combination of initiatives has resulted in a 31% decrease in the time it takes tow trucks to arrive on scene, and a reduction in the average number of vehicles striking an on-scene fire apparatus from one per year to zero in the last two years. These efforts have made a positive impact on not only the safety and mobility of motorists traveling along the freeways within Grand Rapids, but have also been extremely beneficial for the men and women that risk their lives on the highways when responding to crashes. Mainline Dynamic Warning System – ENTERING TRAFFIC WHEN FLASHING Sign Assembly at the intersection of US 2 and County State Aid Highway 46 near Duluth MN, St. Louis County. Close Up of a Sinusoidal Rumble Strip on County State Aid Highway 61 in Crookston MN, Polk County. County roads account for half of the total number of fatal crashes in Minnesota, but only handle 24% of the total vehicle miles traveled in the state. 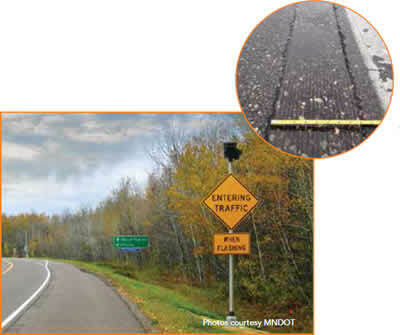 Therefore, in an effort to improve roadway safety and save lives, Minnesota embarked on an ambitious undertaking in 2010 to develop County Road Safety Plans (CRSPs) for all 87 counties. Counties then implement improvement measures based on plan recommendations. As a partnership between the Minnesota Department of Transportation and the Minnesota counties, the primary mission of the CRSPs was to improve the process for identifying safety issues by decreasing the burden on counties to complete a roadway risk analysis, select low-cost proven strategies, and submit complete and accurate projects to the HSIP solicitation with the goal of increasing the number of implemented projects. The CRSPs were built on the systemic approach to rural highway safety. This approach utilized risk as the basis for safety investment decisions rather than actual crash history. The focus of the CRSPs was the implementation of proactive, low-cost safety strategies on a system-wide basis rather than reactive, higher-cost safety projects at fewer locations. This proactive approach allows for funding allocation and countermeasure implementation based on roadway conditions or risk factors that make fatal and serious injuries likely to occur. Implementation of low cost, proactive safety improvements on the county road network (330 projects funded through the Highway Safety Improvement Program for a total of $80 million) resulted in a 25% reduction in the county road fatality rate during the four-year period following the CRSP process. More importantly, evidence suggests that the CRSPs are making a difference in saving lives and helping in the Minnesota Toward Zero Deaths drive. County, Virginia reduced crashes by 89%. 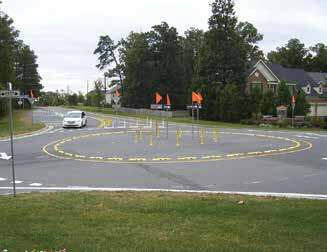 Modern roundabouts are one of the safest forms of intersection traffic control. Studies have demonstrated that they can reduce injury crashes by nearly 90 percent when they replace a two-way stop. The Virginia Department of Transportation (VDOT) is therefore installing roundabouts where appropriate across the commonwealth. However, there is a drawback: replacing a traditional intersection with a roundabout is a substantial construction project that is both costly and time-consuming. 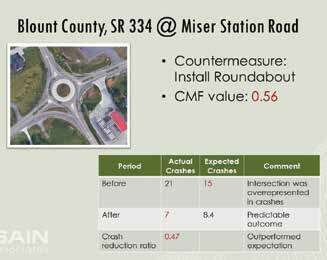 Funding for a roundabout was justifiable based on the crash history, but VDOT could not ignore the immediate safety problem while waiting for permanent construction. Engineers developed an "instant roundabout" using off-the-shelf markings, tubular markers, and plastic curb sections instead of concrete. 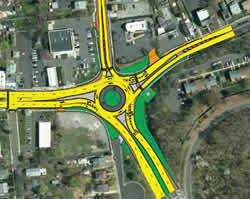 With community support, VDOT installed the instant roundabout in less than six days at a cost of $90,000–95 percent less costly than a permanent roundabout at the same intersection. without a single injury crash, and it has now reduced injury crashes by 89 percent, about what would be expected of a permanent roundabout. A three-minute-long queue on the Edgewater approach has also disappeared. This highlights another key benefit of roundabouts: along with safety improvements, efficiency gains are realized as traffic flows freely in the absence of timed signals. The positive safety results are leading VDOT to consider the treatment elsewhere as an immediate fix for preventing crashes while a permanent solution is identified and implemented. The Department is also working to identify traffic products that can make instant roundabouts even better, with lower maintenance needs. 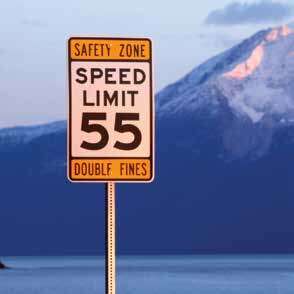 In 2006, Alaska signed into law a bill establishing "Safety Zones" on stretches of state roads documented to have the highest fatal and major injury crash rates and traffic volumes at or near capacity. The primary goal was to eliminate two-lane, high-speed, head-on collisions, centering on the Federal Highway mandated safety goal to focus on severe injury and fatal crashes. The bill directed that 50% of fines be appropriated to Alaska Department of Transportation and Public Facilities (ADOT&PF) highway safety programs, additional enforcement, and education opportunities. The final decision designating a safety corridor is determined by the Commissioner for ADOT&PF and the Commissioner for Public Safety. The resulting data-driven program uses a multidisciplinary approach where cost-effective engineering solutions, education, enforcement, and emergency service reviews ("4E's Approach") combine to combat high-risk driving behavior and mitigate capacity problems until long-term improvements are built. Economical and visible engineering solutions (passing and turning lanes, rumble strips, high level warning signing, and delineation) have been combined with educational tools like radar speed signs and repeated media campaigns, as well as increased law enforcement actions. Emergency responder consultations result in targeted winter maintenance efforts, addressing incident communications equipment needs, and planning for rescue equipment, as well as improved lines of communications between the 4 E's. Data collection appears to reflect fewer high-risk drivers due to increased enforcement and threat of increased fines. This synchronization appears fundamental to each corridor's success. Subsequent data – collected and analyzed yearly – shows that the 4E Approach can have immediate and lasting positive safety effects within a corridor: fatal and major injury crashes are down in Alaska's four established Safety Corridors by 45% overall since May 2006. Additionally, in 2018, the state plans to be able to remove the Safety Corridor designation for the first time: a major overhaul to convert a road into a divided highway is expected to bring the road's fatality and serious injury rate below the state average, and therefore allow it to "graduate" from the Safety Corridor program. The teams competed in a unique design-build procurement which emphasized implementing the most cost-effective safety treatments utilizing Highway Safety Manual (HSM) analysis. A fixed price, $24.11 million, variable scope contract encouraged teams to provide the maximum safety benefit with the dollars available. Proposals were scored based on four categories and one of those categories was HSM safety analysis. HSM analysis was required for each proposed safety improvement, including calculations of the projected reduction of fatal and serious injury crashes. The best value team targeted safety improvements at all 31 locations. 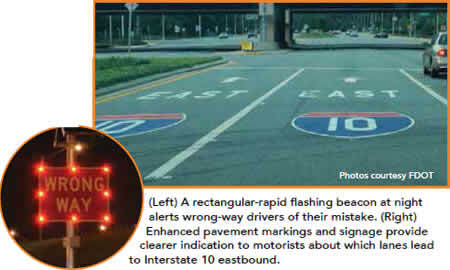 Their proposal included system-wide application of high-friction surface treatment (HFST), inlaid pavement markers, transverse rumble strips, LED stop signs, intersection conflict warning system (ICWS) and a roundabout. Over the period of 10 years, the project is expected to prevent 73 fatal and serious injury crashes. In addition, the winning project is projected to be completed nine months ahead of MoDOT's requirement in the initial procurement. (Top) Existing Route 206 Whitehorse Circle, Hamilton Township, Mercer County. (Bottom) 206 Whitehorse Roundabout to be completed Fall 2017. The intersection of CR 528 and CR 660 in Chesterfield Township, Burlington County had experienced severe crashes and was identified for improvements in the Delaware Valley Region. 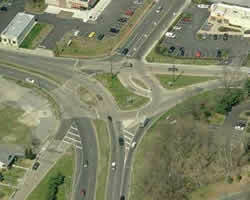 A data-driven approach helped engineers identify the use of a modern roundabout as the preferred design alternative. However, buy-in was also needed from a skeptical public. Engineers and local officials were able to use innovative data-driven safety analysis tools to communicate the benefits of modern roundabouts to the citizens of Burlington County. The roundabout was built in 2014, and the before-and-after crash analysis indicated a 100% reduction of right-angle and left-turn crashes. Due to citizens' support of the Chesterfield Township roundabout, Burlington County has built three more modern roundabouts utilizing a variety of funding sources. NJDOT is confident that use of innovative infrastructure treatments utilizing data-driven tools will result in significant reductions in intersection fatalities in New Jersey. Evaluation is a critical, but all-too-oftenoverlooked, component of robust safety management. To determine the effectiveness of a variety of safety improvements made, the Tennessee Department of Transportation's (TDOT) Project Safety Office –part of the Strategic Transportation Investments Division – committed to analyzing the effectiveness of safety projects in its Highway Safety Improvement Program from 2010 to 2015. Phase One of the analysis examined 261 sites with crash data three years before and after implementation of the safety improvements recommended in the site's road safety audit report. Phase Two of the analysis involved a more detailed review of 45 sites using the Highway Safety Manual (HSM) to estimate crash frequency with and without implementation of safety countermeasures. Phase One suggests that the TDOT safety program has been overall successful in reducing crash frequency by 60%. Comparing before and after crash numbers, there were 157 sites out of 261 that indicated a reduction in crashes after implementation of the recommended countermeasures. Seventy-eight sites had an increase in crashes after implementation and 26 sites had no change. The number of fatalities and incapacitating crashes did not change for 93 sites, increased for 60 sites, and decreased for 108 sites. In Phase Two, TDOT conducted an Empirical Bayes (EB) before/after evaluation of 45 sites. This method included using a safety performance function (SPF) to predict crash frequency, adjusting for site specific geometric and traffic volume conditions, and weighting the observed crash frequency with the SPF-predicted crash frequency to obtain an expected average crash frequency. In measuring the safety effectiveness, it was found that 56% percent of the sites had a reduction in observed after-crash frequency compared to before-crash frequency. The HSM is an excellent tool for introducing crash prediction capabilities to transportation planning, design, and maintenance. As TDOT continues to advance the Project Safety Office with the development of Tennessee-specific data, this information will assist to further implement the HSM effectively. The safety project evaluation will continue as additional projects are completed, and TDOT will use the HSM to achieve its goal of reducing crashes in Tennessee. Our sincere thanks to this year's blue ribbon panel. Each of the judges below dedicated significant time and energy to evaluate the pool of applicants on the basis of innovation, effectiveness, and efficient use of resources. Without their contributions, the Awards program could not succeed.